Nice, I definitely need something like this but dont have the space to permanently set one up. 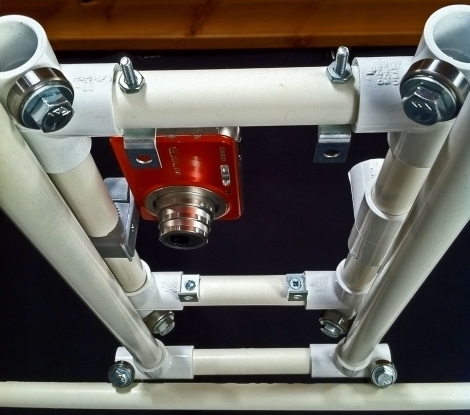 I like it, I am thinking about using 1″ aluminum tube for the long stretches to eliminate sag. Hmmm. Just needs a wireless camera shutter trigger and its complete. The more I look at this the more it makes me want to build one. I would love to build a new work table with this above it, or some version of this. I would want the XY action to be smooth, and bounce free. Most of the time it would just hang there, but if you are going to spend the time and money, it should be a little more solid. Just using larger diameter PVC would help a lot. Also I think I would like to add a remote monitor to see what was on the screen, and if it was in focus. That gets a little harder to do. FIW;I tried to leave the following comment at Grathio Labs, but it kept telling me the the required name and email fields weren’t filled out when they indeed where. Nice project. An alternate way to use the tool handle compound if protecting the ball bearings is a concern is to use a mandrill with the same OD as the bearings to make “tires” that could be placed over the bearings. Perhaps RC model car components could be used instead? @doug: It’s a good idea, thanks for sharing it. Adding a work light to this rig would make it useful even when not filming, nice! What did he use to document the build of that? The Geekgroup recently built a big boy version of this for their sets.